The Digital Research Library of Illinois History Journal™: Illinois' first penitentiary in Alton was unfit for prisoners when it closed in 1860. Then came the Civil War. Illinois' first penitentiary in Alton was unfit for prisoners when it closed in 1860. Then came the Civil War. In historical writing and analysis, PRESENTISM is the introduction of present-day ideas and perspectives into depictions or interpretations of the past. I believe presentism is a form of cultural bias, and it creates a distorted understanding of the subject matter. Reading modern notions of morality into the past is committing the error of presentism. I'm well aware that historical accounts are written by people and can be slanted, so I try my hardest to present articles that are fact based and well researched by me personally, without interjecting any of my personal opinions. The Civil War began with stylish costumes, orchestrated parades, and romantic notions of warfare. Neither the North nor the South was prepared for the endless marching, the awesome reality of battle, the finality of death, or the numbers of prisoners that each side would eventually be expected to support. The attitude of the Union toward the War is illustrated by its first call for volunteers, which was issued by Secretary of War, Simon Cameron on April 15, 1861, and called for volunteers for three months of service. After the first few battles, both the North and the South discovered the seriousness of the war into which they had entered, and additional calls to arms were issued. Before General Robert Edward Lee surrendered in April 1865, Illinois had provided over 259,000 men. In addition to providing thousands of soldiers to the Union, another important requirement of the Civil War was filled by Illinois. Of the thirty-one military prisoner-of-war camps in the Union, four were located in this state: Alton; Camp Butler, in Springfield; Camp Douglas, in Chicago; and Rock Island. Six hundred and forty-seven thousand prisoners were captured by the North and South in the Civil War. Paroles on the field accounted for 264,000 of this total. Of the remaining 410,000 prisoners of war, 215,000 were Confederate soldiers and citizens held in Union prisons; 195,000 were Union soldiers and citizens held in Confederate prisons. By the end of the war, 30,000 Union soldiers had died in Confederate prisons, and 26,000 Confederate soldiers had died in Union prisons. Andersonville (located near Americus, Georgia) accounted for at least 45,000 of the prisoners held by the South, and was by far the largest holding facility in the Confederacy. This camp also had the worst death rate in the South. Between July 1864 and May 1865, 13,000 Union soldiers died, an average of over 1,100 per month. Illinois accounted for approximately 53,000 of the prisoners held by the North. Elmira, New York, was the site of the second-largest military prison in the North, and accounted for 12,000 prisoners. This facility had the worst death ratio of the northern prisons. In its short existence of 13 months, from July 1864, through July 1865, nearly 3,000 Confederate prisoners of war died, an average of 230 per month. Illinois' first state penitentiary, built in 1831 in Alton, had been inspected by Dorthea Dix, famed prison reformer, in 1855. She had reported this facility unfit for prisoners because of its dirt floors and unsanitary conditions. By 1860, the state penitentiary had moved to Joliet, and the prison in Alton was closed. General Halleck, upon learning of the vacant facility, sent a request to Washington that the empty penitentiary be utilized as a military prison. 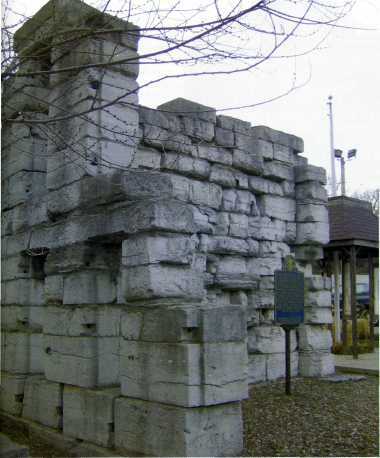 This corner wall is all that remains of the prison that once covered several blocks near Alton's riverfront. Stones from the prison were used in many buildings around the city. In the 1880s, the site was converted into a park and named after Uncle Remus, the character from Joel Chandler Harris' stories. When the park was abandoned, the ruins were relocated to their corner location at the opposite end of the site. The first prisoners were transferred from the crowded Gratoit Street Military Prison (formerly the McDowell Medical College) in St. Louis in February of 1862. W.T. Norton's History of Madison County provides a description of the arrival of the first confederate prisoners of war at the Alton facility: "On a quiet Sabbath afternoon, February 9, 1862, the first consignment of prisoners arrived from the south, brought up the river by steamer. They were... marched from the landing to the prison, passing through a gate in the south wall. It was a motley crowd. Not all were soldiers; they included spies, bridge burners, train wreckers and southern sympathizers of various grades." At first, the exchange of prisoners between the North and South, as provided for in the Dix-Hill Cartel signed in July 1862, kept the number of prisoners down in the prison camps. With the collapse of this cartel, however, prisons in both the North and South began to overfill, and the quality of prison life decreased dramatically. Overcrowding and poor policing of the area made all of the camps breeding grounds for the diseases the prisoners brought with them. The Alton facility, with its 256 cells, was built to house 900 inmates, but, during its use as a military prison during the Civil War, its average population was about 1,200, with a peak of 1,900 in January 1865. During the course of the war, 11,000 inmates spent time in this former penitentiary, which consisted of several block buildings surrounded by a high stone wall. It was located in the downtown area of Alton, just a few hundred feet from the Mississippi River. Since the city slopes toward the river, the prisoners were able to see much of the town, especially the bell tower for the Baptist Church, and many are said to have watched the hands of the clock on that tower as they waited for news of exchange or the war's end. To accommodate the excess prisoners, bunks three beds high were built in the hallways, with mattresses of straw covered by blankets or buffalo robes. The conditions that existed when Dorthea Dix had reported this facility unfit for the housing of criminals, with its dirt floors and unsanitary conditions, had not changed when the Civil War prisoners were moved in. Thousands of prisoners died from infection, malnutrition, dysentery, scurvy, and anemia brought on by the unsanitary, overcrowded, and poorly supplied environment. In late 1863, a smallpox epidemic broke out that resulted in the deaths of hundreds of prisoners and guards. The small five-bed prison hospital could not accommodate the many men stricken with the disease, and when the Mayor of Alton heard of the epidemic, he ordered all Alton hospitals and cemeteries off limits to the prison. Until this decree, the prisoners had been buried in a small cemetery three miles north of the prison, in North Alton. Prisoners anxiously awaited release, but there were not many avenues open to them. In the early years of the war, exchange was a fairly common occurrence, and the prisons went through periods of time when they were very nearly empty between large-scale battles. With the loss of the possibility of exchange in 1863, as the North and South argued over conditions of exchange and Grant made known the advantage of holding so much of the Southern fighting force as prisoners of war, escape and oaths of allegiance to the United States became more prevalent in the camps. These occurrences, as well as the conditions the prisoners found themselves in, are documented in diary entries by Confederate prisoner Griffin Frost: "We left old Alma Mater" (Gratoit Street Prison, St. Louis, Missouri), who by the way has been something of a stepmother, at three, but did not reach our present quarters before dark; immediately upon our arrival we were carefully searched, person and baggage, but I was fortunate enough to smuggle my book through wrapped in a shirt, which I honestly exhibited, but which too beggarly to invite scrutiny. Thirty-two of us occupy a room eighteen feet square; some have bunks, others take the floor. John says they have some pretty tough times, some of the men are treated shockingly, but it is usually the result of a hasty or impudent act, or speech on the part of a prisoner; if a man will strictly obey orders and forebear comment, he is generally safe. "... Discover that our change is very decidedly for the worst, this is a much harder place than Gratiot -- it is almost impossible to sleep on account of the rats, which run all over us through the night; it is hard to tell which are the thickest -- rats or men, there are over two thousand of the latter, and many of them entered for the war; in some of the buildings it is difficult to turn around. There is much sickness; the smallpox is prevailing, and many are dying daily." 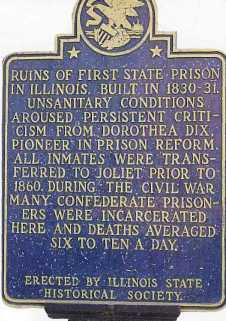 The last prisoner exchange from an Illinois prison occurred in June 1863. At that time, 1,200 prisoners of war at the Alton facility were exchanged, leaving that site nearly empty for a short time. For the remaining 22 months of the war, POWs in Illinois camps who wished to leave prison were limited to either attempting escape or taking the oath of allegiance to the United States. Eighty prisoners escaped from Alton in the four years that facility was in operation. Thirty-five prisoners escaped in 1862, with one mass escape of 27 prisoners through an 18-inch tunnel. In 1864, 46 prisoners attempted to overtake their guards as they left the prison for a quarry work detail. In the ensuing fight, seven prisoners were killed, five were wounded, and two escaped. Two guards were also killed in this attempt. Yet another escape plan was thwarted when two prisoners were caught at the outlet of the prison sewer system, where it dumped into the Mississippi River. One of the prisoners escaped in a coffin in 1863. When the hearse was out of site of the prison, Samuel Breckinridge of Murfreesboro, Tennessee, climbed out of the coffin and escaped to the South. Mr. Breckinridge visited Alton in 1937 and found his name on the Confederate monument for prisoners who had died in Alton. In early 1865, exchanges of prisoners between the North and South on a man-to-man basis became more frequent, and large numbers of prisoners were released on their oaths of allegiance and allowed to go back to what was left of their homes and families. The Alton prison was ordered closed on June 20, 1865, with the remaining 50 prisoners transferred to St. Louis. The War of the Rebellion had ended, and the North and South worked to rebuild the ties that bound them as a Union. The prison facilities were vacated and, in many cases, dismantled, and the cemeteries often fell into disrepair. The Alton facility was torn down, and the bricks sold for use in other buildings. One corner was allowed to remain as a reminder of the prison that once existed. It, too, fell into disrepair. Over the next few decades, as hostility began to lessen on both sides, the prisoner cemeteries in the North and South received more attention, and monuments were placed in memory of those buried in often-unmarked graves. In 1910, the Daughters of the Confederacy dedicated a monument in the North Alton cemetery to the documented 1,300 POWs who died in the Alton prison camp. 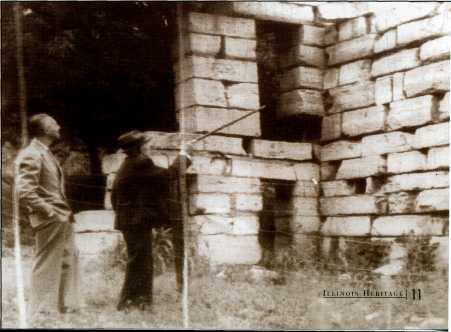 Samuel A. Harrison, a former prisoner of the Alton facility, revisited the site in June 1938 at age 96 to choose a stone for his grave marker. The stone was delivered in 1944. The Chicago Beach Hotel, Chicago, Illinois. 1960s & 70s Devon Avenue Bakeries in Chicago. The Choo-Choo Diner in Des Plaines, Illinois. 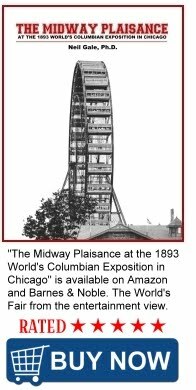 The Chicago Autumn Festival, October 4-11, 1899. Important Chicago Firsts by the Kinzie Family. French Chicago During the Eighteenth Century.